New from Battlefield Legends! 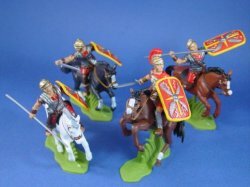 A new and wonderful custom set of Roman Cavalry with officer by Deetail DSG! These highly detailed 54mm (1:32nd scale) figures are meticulously hand painted to the highest standards. Set includes 4 figures in 4 poses with officer. New from Battlefield Legends! 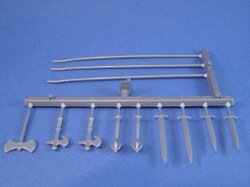 Britains Deetail DSG 12 piece Medieval weapons replacement sprue. 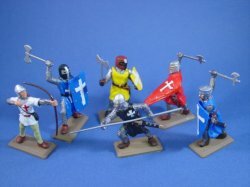 Now you can replace those lost or damaged weapons from your original Britains Deetail Medieval Knights, Saracens and other vintage Deetail figures with these completely compatible soft plastic weapons. New from Battlefield Legends Toy Soldiers! 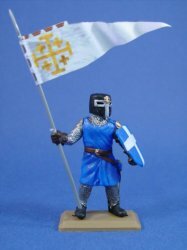 A new and wonderful commemorative collection of legendary King Richard's Crusader Knights by Deetail DSG! These highly detailed 54mm (1:32nd scale) figures are clad in chain armor with colored tunics and shields and meticulously hand painted to the highest standards. New from Battlefield Legends! A new and wonderful collection of legendary Viking Raiders on horseback by Deetail DSG! 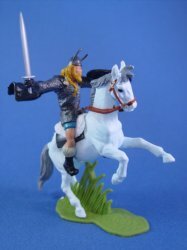 This highly detailed 54mm (1:32nd scale) mounted Viking with long sword is meticulously hand painted to the highest standards. New from Battlefield Legends! 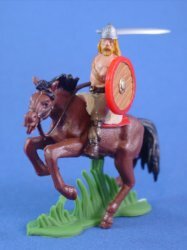 A new and wonderful collection of legendary Viking Raiders on horseback by Deetail DSG! This highly detailed 54mm (1:32nd scale) mounted Viking with battle axe is meticulously hand painted to the highest standards. New from Battlefield Legends Toy Soldiers! A new and wonderful commemorative collection of legendary English Knights by Deetail DSG! 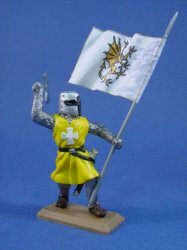 This superbly detailed 54mm custom Knight with banner is meticulously hand painted to the highest standards. New from Battlefield Legends Toy Soldiers! A new and wonderful commemorative collection of legendary English Knights by Deetail DSG! These highly detailed 54mm (1:32nd scale) figures are clad in chain armor with black tunics and shields and meticulously hand painted to the highest standards. New from Battlefield Legends Toy Soldiers! 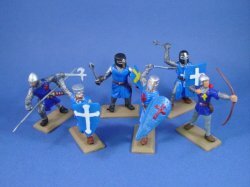 A new and wonderful commemorative collection of legendary French Knights by Deetail DSG! 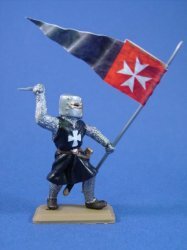 This superbly detailed 54mm custom Knight with banner is meticulously hand painted to the highest standards. New from Battlefield Legends Toy Soldiers! 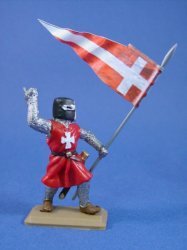 A new and wonderful commemorative collection of legendary French Knights by Deetail DSG! These highly detailed 54mm (1:32nd scale) figures are clad in chain armor with blue tunics and shields and meticulously hand painted to the highest standards. New from Battlefield Legends Toy Soldiers! 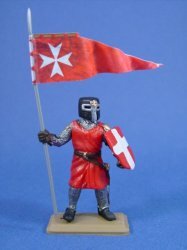 A new and wonderful commemorative collection of legendary Hospitaller Knights by Deetail DSG! 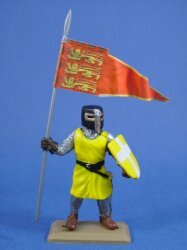 This superbly detailed 54mm custom Knight with banner is meticulously hand painted to the highest standards. New from Battlefield Legends Toy Soldiers! 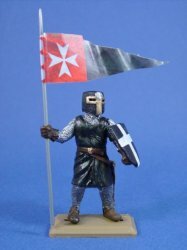 A new and wonderful commemorative collection of legendary Hospitaller Knights by Deetail DSG! These highly detailed 54mm (1:32nd scale) figures are clad in chain armor with red tunics and shields and meticulously hand painted to the highest standards. New from Battlefield Legends! 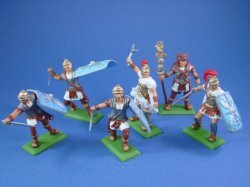 A new and wonderful collection of legendary Centurions of the Roman Imperial Legion by Deetail DSG! 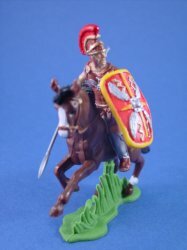 This highly detailed 54mm (1:32nd scale) mounted Roman officer is meticulously hand painted to the highest standards. New from Battlefield Legends! 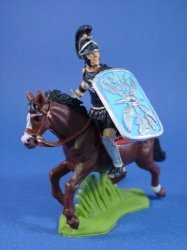 A new and wonderful collection of legendary Centurions of the Roman Imperial Legion by Deetail DSG! 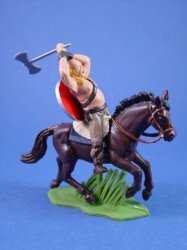 This highly detailed 54mm (1:32nd scale) mounted Roman cavalryman with spear is meticulously hand painted to the highest stanndards. New from Battlefield Legends! A new and wonderful commemorative collection of legendary Roman Imperial Legion soldiers by Deetail DSG! These highly detailed 54mm (1:32nd scale) figures are clad in armor with white tunics and meticulously hand painted to the highest standards. New from Battlefield Legends Toy Soldiers! A new and wonderful commemorative collection of legendary Roman Imperial Legion soldiers by Deetail DSG! 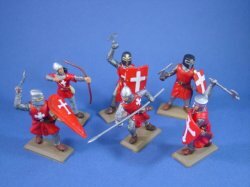 These highly detailed 54mm (1:32nd scale) figures are clad in bronze armor with red tunics and shields and meticulously hand painted to the highest standards. New from Battlefield Legends! 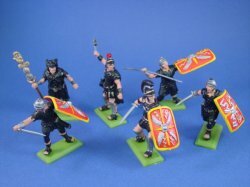 A new and wonderful collection of legendary Centurions of the Roman Imperial Legion by Deetail DSG! 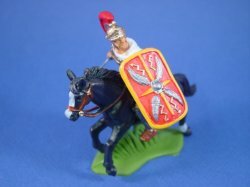 This highly detailed 54mm (1:32nd scale) mounted Roman officer with red shield is meticulously hand painted to the highest standards. New from Battlefield Legends! 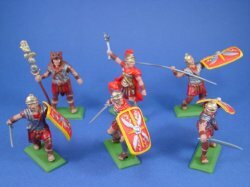 A new and wonderful commemorative collection of legendary Praetorian Guards of the Roman Imperial Legion by Deetail DSG! These highly detailed 54mm (1:32nd scale) figures are clad in black armor with red or blue shields and meticulously hand painted to the highest standards. This band of fearless Praetorians will surely strike fear into any foe brave enough to cross their path. CUSTOM ARCHERS - LIMITED EDITION SET - New from Battlefield Legends Toy Soldiers! 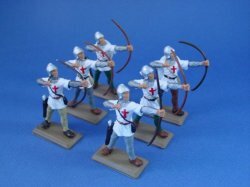 A special custom set of Templar Archers by Deetail DSG! 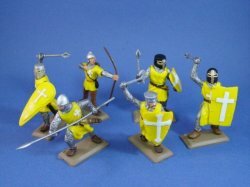 These highly detailed 54mm (1:32nd scale) figures are clad in chain armor with white tunics and shields and meticulously hand painted to the highest standards. 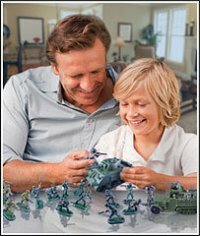 New from Battlefield Legends Toy Soldiers! 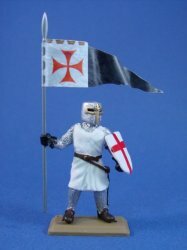 A new and wonderful commemorative collection of legendary Templar Knights by Deetail DSG! 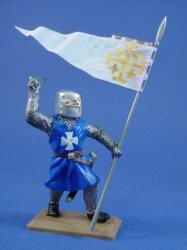 This superbly detailed 54mm custom Knight with banner is meticulously hand painted to the highest standards.